After months of focus and preparation for one specific event, it feels strange to have my spring goal race completed. 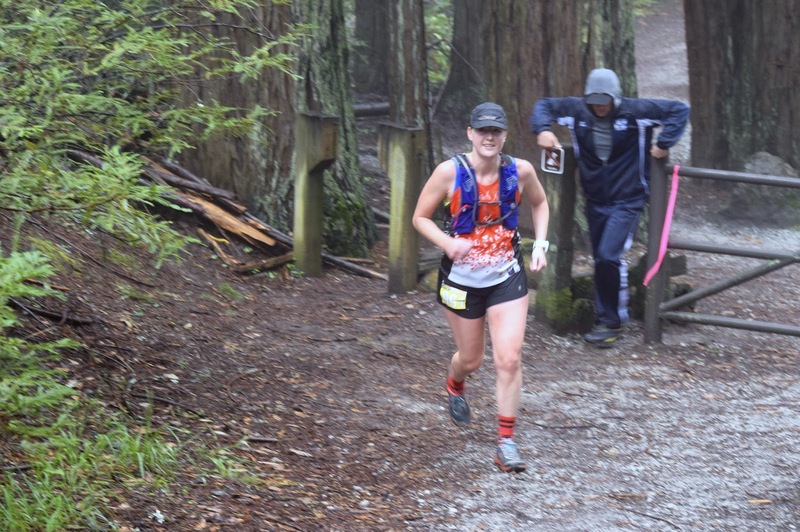 I chose this race back in the fall because I love running in the Redwood forest, and I'm very happy with my choice. 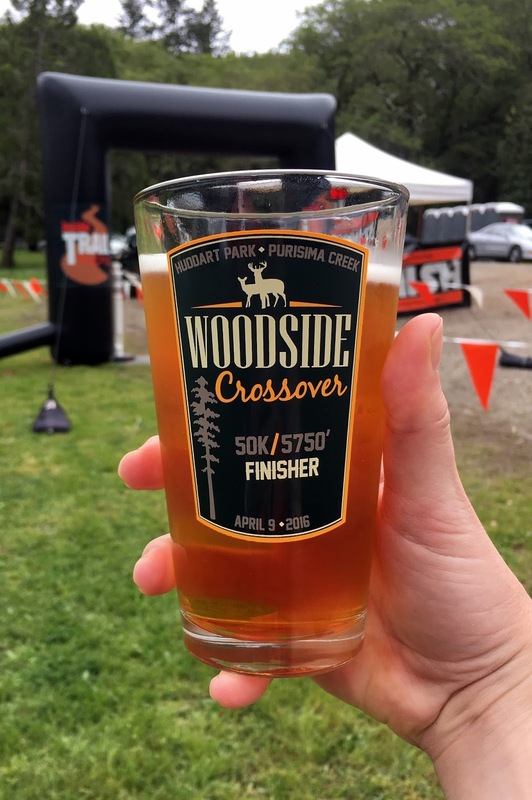 Woodside Crossover is organized by Inside Trail Racing, which provides runners with beautiful courses, friendly interactions, and excellent swag. I am personally excited about the pint glass they give to 50K finishers; that may or may not have influenced my race choice. Ok, it did a little. Race day dawned with light rain, heavy cloud cover, and temperatures in the low 60s. I could do without the rain part, but overall the conditions were great because the tree cover prevented pellets of rain and the clouds kept us cool. The conditions made it look misty and eery in the woods. Kevin took me to the start line and hung out for a few minutes, then he headed up to Skyline aid station where he would be volunteering all day. 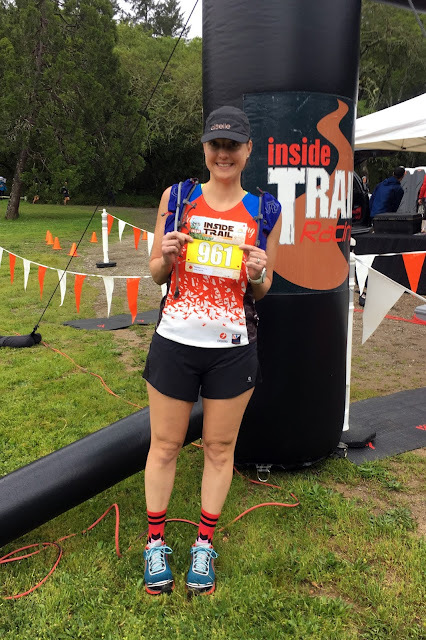 I grabbed my race bib, ate a few last minute bites of a Picky Bar that my body didn't want, and hit the restroom. A bit later I found friends Imogen and Rebecca and chatted with them until the start, which eased my nerves a bit. The race director gave the spiel about course markings a few minutes before 8:30, and then we were off! Yellow bibs for the 50K. Hanging out with Imogen at the start. The race starts with a gentle 4 mile climb to Skyline Road. As per usual for me, the climb involved both running and hiking to keep myself comfortable; I haven't figured out what I can really do at the 50K distance yet, so I'm still stuck in 'make sure I can finish' mode. Plus, I knew the next two big climbs were long and steep, and I needed all of my energy to do those well! Climbing Chinquapin. Official race photo courtesy of Let's Wander Photography. As I neared the top I became excited to see Kevin for the first time. Little did I know, I was about to find a bunch of friends cheering and volunteering at the aid station! Go Far (Meghan, Josh, Jean, Carol, Davidson, Isaac, and Kevin) had planned a surprise cheer group and decided to volunteer when the race needed help, and Sophia had come too. I was so excited to see them; it's incredibly special to have a group of friends that are so supportive. I wanted to hug each and every person and stay to chat, but alas I had to keep going after a minute and a handful of goldfish crackers. Luckily I would see them all again after the big climbs because the course goes by that aid station three times. I left the aid station high on life and must have smiled for who knows how many miles straight. I kept thinking 'wow everyone is here!' and 'I'll see them again later!' Honestly, I don't think words can express just how happy and appreciative I am of these awesome people for coming to cheer and volunteer, in the rain nonetheless. 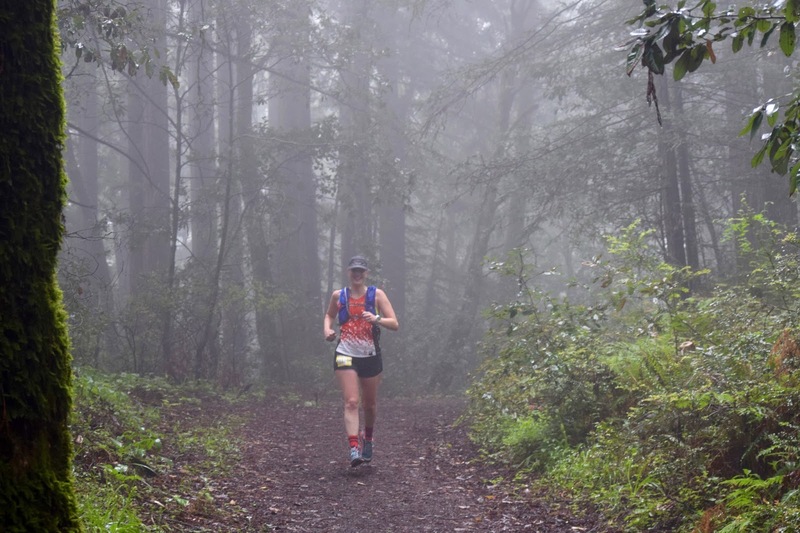 The next part of the course was a big downhill followed by a fairly flat section along Purisima Creek. After a few miles, the trail makes a sharp right turn and begins the next big climb up to Skyline Road at the North Ridge aid station. I found this climb to be the hardest one because it is almost 4 miles and has some very steep sections; it was especially hard to climb those when the mud caused me to slip backwards on the way up. I'm glad I had done this climb two other times during long training runs because I knew exactly what to expect. I enjoyed seeing other runners on the short out-and-back section to North Ridge aid station, sharing high fives and words of encouragement with one another. I grabbed a couple of boiled potatoes dipped in salt, drank a little bit of Mountain Dew (they were out of Coke,) and went on my merry way back down the hill. After the out-and-back we turned onto Craig Britton trail, which I'd say is my favorite part of the course. There's really nothing like miles of mostly downhill, single-track trail across a ridge and through the Redwoods, and that's what Craig Britton provides. I enjoyed it and mentally prepared myself for the last big climb to Skyline Road. Before I knew it, I was back at the uphill section of Purisima Creek trail and climbing for 3 more miles to Skyline. This part of the course is my least favorite not because of the climb, but because it's a section of wide fire road without awesome views. About half a mile from the top I saw a Go Far track suit coming toward me, and it was Josh coming to hang with me for the rest of the way to Skyline. This was another huge mental pick me up! I took a little more time at the second pass of the aid station to have potatoes and Coke, swap out my pack for a hand bottle, and use Body Glide. Everyone was still there cheering and chatting, which kept me excited to keep going. 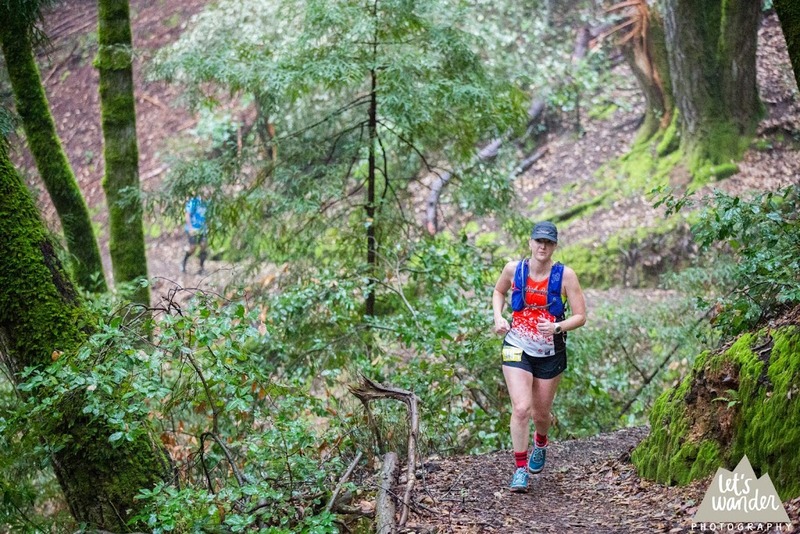 The next section of the course was a runnable out-and-back along Skyline trail. What I realized after leaving the aid station is that I was pretty darn tired from the climbing. This obviously wasn't a shock, but some part of me had hoped I'd be more fresh than I felt. I kept moving, mostly running slowly with a bit of walking, trying to keep my head in the game. Skyline is a lovely single-track trail in the woods with some uphill and some downhill rolls along the way. Half a mile or so later I caught up to my new friend Gautam, and we ran in the vicinity of each other for the next couple of hours. It was nice to have someone to chat with and to keep me going. We made it to the turnaround aid station where I grabbed more potatoes and refilled my Tailwind, then headed back to the Skyline aid station for the third pass. We knew once we hit the last aid station it was almost all downhill and we were looking forward to that. The weird part about the next couple of miles is that it got really lonely. Where had all the people behind us gone? We had seen them on the out-and-back at North Ridge aid station, but now there were way less people. Gautam and I continued making our way back along Skyline trail together. We hit the Skyline aid station again, I refilled Tailwind and Kevin informed me it was 4.5 miles to the finish. My watch was ahead, so I realized it would say 32+ before I the finish line and wrapped my head around that. I felt quite good, but I also felt it was taking me longer than I wanted and like I was moving in slow motion at times. 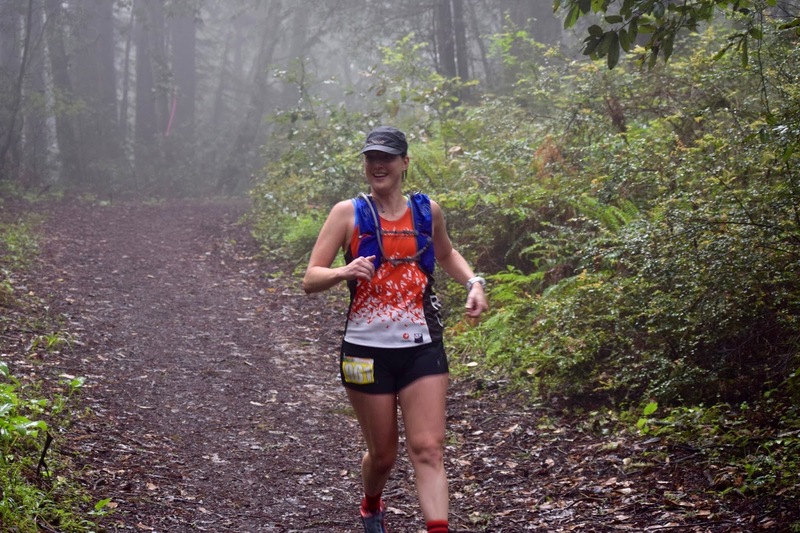 I remember feeling the same in my first 50K; it sounds like I need to work on pushing myself harder, sooner. I took off on the downhill portion and passed three people, which was a good ego boost. We went uphill a little and I was fading, but Gautam was there to tell me to keep running. At some point, the downhill fun turned into another portion of uphill and I broke away from him a bit. I knew that portion of trail and exactly how much uphill there was, which helped me mentally push through it. 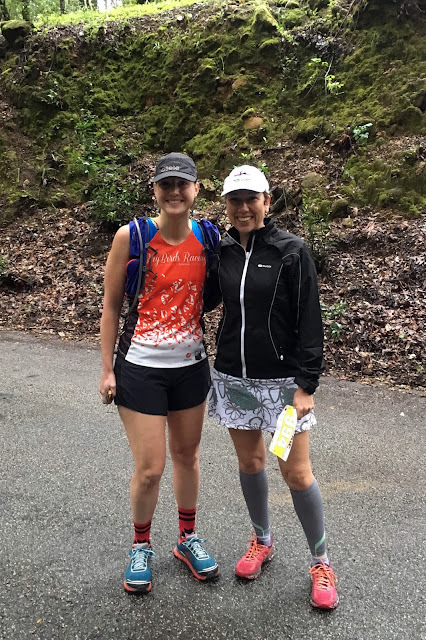 We ended on a new-to-me trail that was awesome, although I felt like the finish line was never coming because I was at 32.5 miles on my watch. Yes, I realize GPS isn't as accurate as course markings but that doesn't make it easier to deal with sometimes. Finally we popped out of the woods and into the meadow to finish. I'd made it! I crossed the finish line at 7:36:52 with Kevin there to cheer me on. I definitely wasn't speedy, but I succeeded on a really tough course and I'm letting myself be proud of that! I didn't have a specific time goal, although I admit I had hoped to beat my last 50K time of 7:23. However, this course was significantly harder and in the end, I'm happy with the outcome. Kevin and I hung around the finish area for a while, cheering for Gautam and Imogen and chatting with a lovely couple from Germany. I filled my finisher pint glass with Lagunitas IPA immediately and then enjoyed some chicken noodle soup. A finisher pint glass! Best ever. As for feeling lonely in the second part of the course, I found out after finishing that a dozen runners had dropped from the 50K to 35K at Skyline the second time through. Plus, a few more beyond that missed the cutoff for the 50K and were forced down the 35K route. That explains where everyone went! It was a strange feeling to see so few runners on the course near the end, but at least I know where everyone went. Overall, I had a wonderful time at the Woodside Crossover 50K and I love running in Woodside. 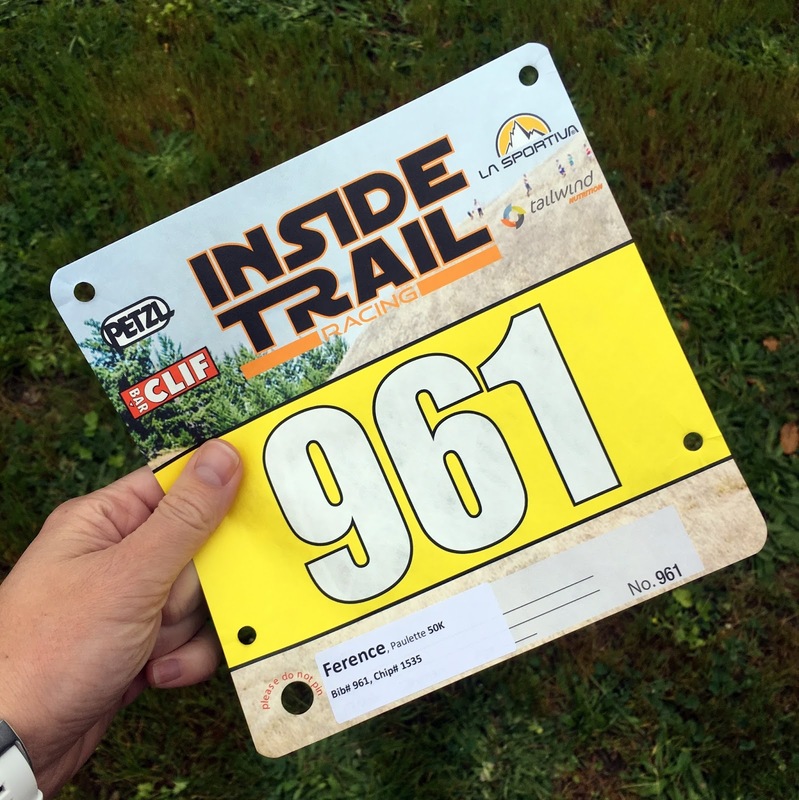 I highly recommend the course and Inside Trail Racing to anyone. Congrats Paulette! That pint class is sweet especially because it has the elevation listed on it! Enjoy. Great report too. What a great surprise to have your peeps surprise you. Enjoy some recovery!! Oh, my gosh, Paulette! What a fantastic accomplishment! As I read this post, I was trying to imagine what it must have been like to see your friends for the first time at the aid station; that is just magical. And then to know that you would see them again several times? What a wonderful surprise; sounds like you have quite the cheerleading squad. 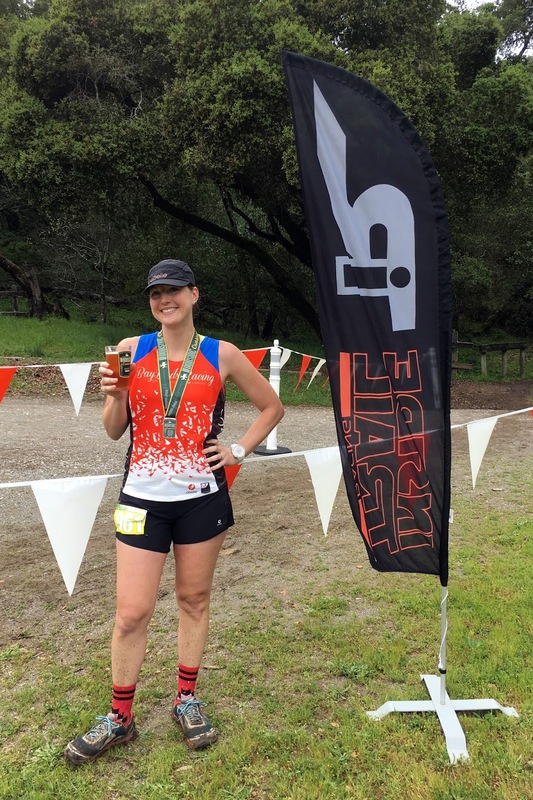 :) It's definitely notable that so many people dropped out before the finish and being able to train along the race course, for you, must have been such a great confidence builder as you got through those empty miles. Way to go, girl!! Love these pics!! Thank you Tara! Yes - so magical to see everyone out there! Thanks Layla! Beer count is already getting higher on that pint glass this week. :) Kevin keeps cleaning it and refilling only that one for me, which is adorable. You should do another one! haha. There is more climbing on this course was harder for sure, however I found Skyline to the Sea to have it's own major challenges. That downhill with rocks and such is no joke. I wouldn't necessarily say I found this to be way tougher, just different.